It is a known fact that credit cycles often lead business and economic cycles. It makes sense on paper and even more sense in practice. This is a subject that we havehardly yet touched on, but will be doing so in this piece. For a majority of the investing community, the topic on credit cycles remain much of a novelty. We feel that it's crucial to at least have a fair understanding of what's going on in the corporate credit market, because in most respects, credit almost always leads equities (there are plenty of backing anecdotes). We'll specifically be talking about the corporate credit default cycle in the U.S. debt market in today's note. We have also included an insightful excerpt from the 18th Annual Credit Report put out by Deutsche Bank at the end of this piece. But before we go further, we wish to state that although this topic has gained moderate coverage on financial media, most traders and investors will likely still be uneligtened on the tempest that is current brewing in this teapot. This is a situation which we feel beggars much more attention but isn't getting it, and is certainly not superfluous gibberish. For the record, we're not credit market specialists or experts by any stretch of the imagination. Anyone with basic knowledge on financial markets should be able to appreciate what's coming. A default occurs when when an institution fails to deliver on its financial obligations when they come due. In our context, corporations default when they fail to make either or both an interest payment on a marketable loan or bond security. This includes levered loans, commercial paper, bills, notes, and bonds. This is irregardless of the seniority of debt, and pertains to both secured and unsecured debt. Note that the ISDA (International Swaps and Derivatives Association) has its own set of specific guidelines to what constitutes a credit event. A credit event triggers CDS payouts to those who have bought those CDS on that specific security or tranche of securities. It is a separate topic altogether and we won't be going down that rabbit's hole in this piece. As of March 2016, total default volumes on HY bonds (high yield) and institutional loans in the U.S. hit a 6-year peak of approximately $16.2bn, almost half that seen in the entire of 2015. Just this past week alone, we saw at least 4 corporate defaults with 3 in the energy sector. So far in 2016 (Jan-Mar) default volumes have reached a jaw dropping $32.4bn. To put this in context, 2015's default volume (which was already abnormally high) stood at $37.7bn. If this trend were to continue through 2Q and beyond, we are talking about a full-fledged wave of defaults. "The U.S. corporate default situation is not something you want to turn a blind eye to. Default volumes in March reached a staggering 6-year high, challenging that of 2009's Lehman peak. While a majority of the defaults are the result of energy firms going bust, this is spreading to related sectors such as materials. One can only imagine the poignant picture in other developed commodity-driven economies such as Canada where we presume the situation is multiples worse." 1Q16 had the 5th highest default volume on record, as shown in the set of charts below. Further analysis of the data indicates that defaults started escalating in June 2015, right when global oil prices were steadily crashing and the energy sector started feeling the brunt of mounting losses from their hugely unprofitable operations. Ah share buybacks, or corporate stock repurchases as they are also known. Something that has become so perverse in the U.S. that unless you've been living in the Amazon rainforest for the past 3 years, you would have surely heard about how American companies are in a frenzy to buyback their equity. We have commented a lot on share buybacks and their immense significance not only for the companies themselves but also for the broader capital markets (check out our Facebook page for all of our coverage). In the set of charts below, we talk more indepth about the share buyback situation, and why it relates to the longer term trajectory for stocks. In brief, buybacks have remained the largest single source of equity inflows on the S&P 500. Buyback volumes have also been relatively consistent through the past 3 years and have been in a controlled up trend. Buybacks in 2015 alone amounted to $561bn, the second highest year on record following the pre-Lehman peak in 2007. Absent these flows from buybacks, we would probably trade much lower on the stock market. "We know that both smart money and retail money have been net sellers of U.S. equities for a good part of the last 6 months or so, but stock prices haven't fallen much if at all (ignoring the 2 volatility flares in August 2015, and in January 206). So who has been buying? Simple: None other then the corporations themselves, share buybacks as they are called. We have spoken a lot about this trend already but based on the latest EPFR data, Goldman has provided us with lots of clarity as to how much shares corporations have been repurchasing (with the guise of creating shareholder value by bolstering stock prices). "Corporations purchased $561 billion of US equities during 2015, 40% higher than during 2014 ($401 billion) and the second highest level since at least 1952 ($721 billion in 2007). Managements remained committed to share repurchases (net of issuance) last year amidst modest US GDP growth of 2.4% and extended valuations. Outside of the Great Recession, corporates have been the primary source of US equity demand. Buybacks will remain the key source of equity inflow in 2016. We expect corporations will purchase $450 billion of US equities in 2016 and will remain the largest source of US equity demand. With the US economy expected to grow at a modest 2% pace and cash balances at high levels, firms are likely to continue to pursue buybacks as a means of generating shareholder value. We forecast S&P 500 EPS will rise by 9% to $110 this year from $100 in 2015 (see US Equity Views, March 14, 2016), which should also benefit allocation to buybacks."" 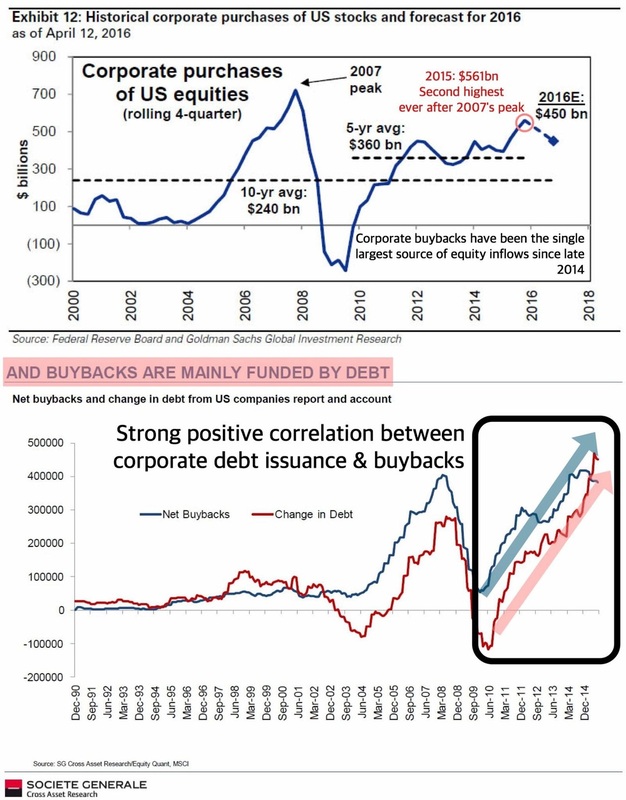 While you're letting that sink in, it's also important to recognize that the strong positive correlation between buyback volumes and corporate debt issuance. This makes more sense when we take into account that S&P 500 EPS has most likely, if not already peaked in 3Q15. Net margins have likewise peaked well before the onset of the bear market in global energy prices. This is mostly true across all sectors, and particularly acute in energy and financials. In other words, we are most probably already in an earnings recession; true for S&P 500 companies and the broader Russell 2000. In the traditional setting of declining profitability, a plateau in EBITDA, and surging sales-to-inventory ratios, one would expect scaled down repurchase activity but the opposite has been happening. Which leads us to our next point: Companies are largely using cash raised through debt issuance to fund their share buybacks. This isn't sustainable on many aspects. For one, the relative ease of raising capital in the debt markets has been largely because of artificially low interest rates and a Fed that is adamant on normalizing too quickly. Even so, spreads have already been widening especially for down in quality names. There is clearly concern over this quasi debt-for-equity swap that corporations are hooked on, and we don't feel at all comfortable about this. First and foremost, corporate debt levels are uncannily high for where we are on the business cycle. Debt and current ratios clearly point to a downcycle in credit and a trend towards higher default rates. These parts are currently not synchronous as companies continue to lever up in an earnings recession and general fragility of the broader economy. If this is truly the case of credit leading equities, then the current elevated (and still widening) spreads should imply that stocks trade significantly lower. This when coupled with an unfavorable macro environment of a strong dollar, indecisive Federal Reserve, volatility in crude oil prices, and abnormally low implied volatility in stocks (complacency) makes for a potent concoction that could well put equities in a downward tailspin very quickly. While a large majority of defaults have been in the energy sector, financial contagion risks exists and we feel banks do not generally have strong enough firewalls to withstand an adverse shock should energy credit continue to deteriorate in quality. Other sectors that remain vulnerable include industrials, materials, and to a lesser extent financials. Speaking from a macro perspective, large and persistent capital outflows from the HY bond market could spread a fire in the broader risk markets, leading to an overshoot in hedging and liquidations. In such a case, the fire is likely to spread quickly and abruptly. Fundamentally, higher default rates often coincide with economic downturns, and in many cases precede them. There might be a slim chance that the tail wags the dog this time — the credit default cycle goes so deep into drawdown that it adversely affects consumer spending and private investments, greatly increasing the likelihood of a recession. We will be watching the events in the U.S. corporate credit market closely ontop of monitoring similar events in other more susceptible regions like China, where one fall of a domino can lead to a chain reaction. What is alarming to us is that this topic hasn't gotten the widespread attention it duly deserves. Investors and portfolio managers who do not recognize this hotspot in systemic risk might be opening themselves up for a rude awakening. Lastly, we leave you with some excellent analysis by Deutsche Bank that should provoke some thoughts. There are clear signs the cycle is turning, especially in the US. Our US strategists have previously suggested that we need the combination of three conditions for us to be confident the next default cycle is imminent. We need the accumulation of excessive debt and preferably of deteriorating quality, some kind of external shock/trigger and tighter monetary policy/a flattening of the yield curve. The pieces of the jigsaw are building.US corporate debt accumulation now compares with that seen prior to previous default cycles. Equity volatility has seen two spikes in the last 12 months (August and early 2016), bank equity is falling (a lead indicator of lending?) and global yield curves continue to flatten. The buildup of excess is often a pre-requisite for bubbles to burst or for economic cycles to be vulnerable to shocks. One argument for why this US economic cycle might still be able to run for a few years is that many economists feel that excess hasn’t been as prevalent as in prior cycles. However one can argue there has been a sizeable increase in US corporate debt since the GFC comparable to increases prior to previous default cycles. As Figure 15 shows, in the modern era of leveraged finance the debt cycle waves have been well correlated to defaults. We’ve used single-Bs to keep credit quality constant throughout and used Fed data to determine non-financial corporate debt/GDP. Our US credit strategists measure the total growth of debt stock as well as its aggressiveness to determine whether there has been sufficient “material” created to feed the next wave of defaults. Figure 16 looks at the growth of the stock of US HY debt as well as the aggressiveness of new issuance. The former is measured by the combined size of the HY bond market (USD developed markets) and loans on U.S. bank balance sheets. The graph shows distinct periods of debt growth in the past, going back to the late 1980s, with each of the past three complete credit cycles preceded by waves of new debt creation, lasting from four to five and a half years, and resulting in cumulative debt stock growth of 53-68% (shaded areas). The current episode, measured since early 2011, has lasted 5.2 years and resulted in 64% growth in the combined value of the high yield bond market and loans on bank balance sheets, putting it comfortably inside the range of previous cycles. It shows a similar result to our own US corporate debt/GDP chart. For a measure of aggressiveness in recent issuance trends, our US strategists look at CCC-rated issuance in HY and leveraged loans, as a percentage of totalmarket size, as shown in the right-hand graph of Figure 16. Volume is presented as a percentage of total market size (HY + loans), on a trailing-12- month basis. Shaded areas again highlight previous debt growth cycles, as well as the most recent one, with figures printed inside representing cumulative CCC issuance volume for the full duration of each episode, divided by the market size at its start. The previous two credit cycles, in the late 1990s and mid- to late 2000s, saw this indicator expand by 20% and 18%, respectively, compared to its present value of 17%. Unfortunately, there is a lack of detailed issuance data to extend this to the first cycle in the late 1980s. The analysis is somewhat conservative in estimating the starting point of the current credit cycle to be January 2011. Arguably, the market was healing and perhaps even expanding in 2010, which would make these measurements of pre-requisite debt growth and aggressiveness look even more stretched here. We will nonetheless use the numbers shown above, as we aim to build our case for the timing of the next default cycle based on the more conservative assumptions. We can therefore conclude that pre-requisites for the next default cycle are now in place. The artificial ingredients keeping defaults below their 1983-2003 levels are still broadly in place so although we expect the next default cycle to be round the corner it could still be mild relative to the early 90s and early 00s cycle and even the already subdued 2009 cycle which was very short, especially given the economic wreckage seen. As we’ve suggested in previous editions of this report, this is likely due to the increasing artificial demand for fixed income seen over the last 15-20 years which effectively allows more financing opportunities for levered companies at lower yields than they might be asked to pay if global fixed income markets were a perfectly free market where the only consideration was relative value. Over the last two decades, SWFs, pension funds, insurance companies, banks and more recently central banks in great size have distorted the demand for and yield of global fixed income. This is unlikely to change and although the Oil and Gas sector demonstrates that bad fundamentals can still win out, for more marginal companies, the artificial conditions in fixed income could still help prevent a more savage cycle. Obviously the Oil and Gas sector will play a big part in determining the overall level of defaults and in a separate section our US strategists detail their expectations for defaults in this sector and how that will filter through into the wider US HY market. It’s also true that credit spreads are relatively elevated and price in a default rate markedly higher than current levels. Indeed as we’ll see throughout the body of this report, at an aggregate level a buy-and-hold investor would need to see defaults worse than virtually all observed periods through history for them not to get a positive excess return relative to Government bonds from this starting point. However if we do see a recession even if defaults are relatively subdued the illiquidity of financial markets could easily see big mark-to- market losses. Recession tend to bring big overshoots in credit spreads relative to default risk anyway. So lower structural defaults may not provide comfort in the heat of the next recession but current spreads should give longer-term investors some comfort across the vast majority of sectors. Older PostThe Next Big Trend In Currencies?